Typically for a workbook (and sometimes for a text book), I would make lesson plans in a grid format, and after printing the lesson plans I would glue them to the inside front cover of the workbook. I kept a copy of the lesson plans in my notebook, and when I thought it was necessary, I would add notes to my "teacher" plans. Below I will copy and paste the student plans and the teacher plans and I will include printable files. If copying and pasting the TXT plans into V Planner, be sure that pasting does not change the background color of the S Sheet. If the S Sheet background changes to white after pasting, be sure to fix that by always selecting "Match Destination Formatting." See illustration below, click illustration to see full sized image. 1. Read Concepts in Design pages 1-2. Turn to page 49 and read all of the words and definitions. Look up any words that you cannot pronounce in the dictionary and learn to say them correctly. Read pages 3 and 4 and stop at Line. 2. Line: Read pages 4-7: What is a line, actual line, implied line, imaginary or mental line, edge. Do activity 1.1 on page 7. 3. Texture: Read pages 8-11; Do activity 1.2. Turn to page 11 and do activity 1.3. Take your rubbings, trim each example to approximately the size of the blocks in your book on page 9, and attach each one to a block with a glue stick. 4. Value: Read pages 13-14, do activities 1.4 and 1.4a. 6. Do activities 1.6 and 1.7 on pages 17-18. Do as many tangrams as time allows. 8. Symmetrical, Asymmetrical, and Radial: read pages 21-23, do activities. Optional: Supplemental Activity #2 from teacher's book goes with today's lesson. 9. Space: Read pages 24-26, do activity 2.1 on page 26. Optional: Supplementary Activity #1 from teacher's book goes with this lesson. 11. Movement and Rhythm: Read pages 32-34; make a collage as directed in the instructions in the book. 12. Division of Space: Read pages 39-40. Study Part II, pages 20-40, read over vocabulary. 13. Self Test 2, pages 40-41. Use the remainder of your time to study the entire unit. 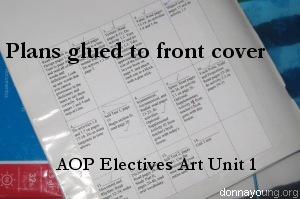 Class requires Alpha Omega's LIFEPAC Electives Art I Unit 1 and teacher's book. Day 8 Materials: old magazines, art books, Optional: worksheet one from teacher's book – clipped – (exactly as student copy) – Note: For lack of examples in magazines, fall back to drawing examples of balance or looking at examples of architecture.